A few months after the International Olympic Committee first announced that mixed doubles would be part of the Olympic program, I had a chat with Jeff Stoughton who had been chosen to head the mixed doubles program for Curling Canada. He was very clear at the time that he anticipated elite men’s/women’s curlers would dominate Canadian mixed doubles in the 2018 Olympic cycle, but his hope was that Canada would eventually develop elite mixed doubles teams consisting of players who weren’t necessarily members of the top men’s and women’s teams in the country. Stoughton’s comments could prove to be prophetic as we are seeing early signs of this very transition. The field at the 2017 Olympic Mixed Doubles Trials was littered with players coming off the disappointment of having failed to earn a spot in the Olympics with their men’s or women’s teams. Several teams at the Mixed Doubles Trials were put together hastily after members of Team Koe and Team Homan became unavailable due to their victories in the men’s and women’s trials. Of course, the most famous of the teams put together “at the last minute” was Kaitlyn Lawes and John Morris who went on to win Olympic gold. The field at this year’s Canadian championship includes several young teams that qualified for Fredericton by winning their provincials such as Chantele Broderson/Kyler Kleibrink of Alberta, Catera Park/Cody Tanaka of BC and Rachel O’Connor/Ryan Abraham of PEI. The Canadian Mixed Doubles Rankings (CMDR) themselves are slowly starting to show a transition to a younger generation. Teams such as Ashley Groff/Kyle Doering, Danielle Schmiemann/Jason Ginter and, of course, Kadriana Sahaidak/Colton Lott will all be in Fredericton on the strength of their CMDR points while Dezaray Hawes/Tyler Tardi earned their spot by winning Curling Canada’s NextGen mixed doubles event held during the Canada Cup this past December. 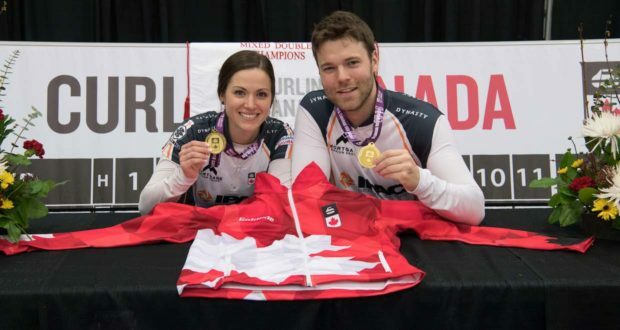 Fear not, the field at the 2019 Canadian Mixed Doubles Championship also includes several familiar faces. Laura Walker/Kirk Muyres will be there to defend their title while Jocelyn Peterman/Brett Gallant, Jolene Campbell/John Morris, Kate Cameron/Reid Carruthers and Jennifer Jones/Brent Laing will all be in Fredericton looking to earn the victory and represent Canada at the World Championship. The field also includes several teams that were competing in mixed doubles “before mixed doubles was cool”. Fan favourites and 2014 Canadian champs Kim Tuck/Wayne Tuck Jr. (ON), Sherry Just/Dustin Kaltoff (SK), Emilie Desjardins/Robert Desjardins (QC) and Katie Cottrill/Shawn Cottrill (ON) will all be in Fredericton. The current and future direction of Canada’s mixed doubles program is a work in progress and the leadership at Curling Canada doesn’t shy away from that. The challenge is to ensure that Canada is well represented and achieves results at the international level while also fostering the growth and development of young mixed doubles team. There are many who still believe that Canada’s best chance in international mixed doubles is to be represented by elite curlers with strong resumés in the men’s and women’s game. However, the success of Kadriana Sahaidak and Colton Lott, especially their victory at the World Cup event in Sweden where the reigning world champions were among the teams they defeated, has proven that a lack of extensive experience in elite men’s and women’s play doesn’t preclude players from mixed doubles success at the national and international levels. One way in which Curling Canada could perhaps expedite the development of young mixed doubles teams is funding athletes in only one discipline under Curling Canada’s National Team Program. This season, of the 18 athletes that were selected for mixed doubles funding under the umbrella of the National Team Program, 12 of them played on men’s or women’s teams that are also part of the program. By limiting funding to one discipline per player, Curling Canada would make it possible for more athletes to receive additional coaching and training while also allowing them to travel to more mixed doubles events and gain valuable experience while competing against some of the world’s other top mixed doubles team. Of the 18 athletes that received mixed doubles funding this season, eight of them will not be competing in Fredericton. According to Curling Canada, Val Sweeting and Brad Gushue forfeited their funding when they decided not to play mixed doubles this season and Kadriana Sahaidak and Colton were added to the program last Fall, presumably filling the spots forfeited by Sweeting and Gushue. Among the other funded athletes that will not be in Fredericton; Chelsea Carey and Colin Hodgson are not competing because Carey is at the Women’s Worlds in Denmark, Joanne Courtney is expecting in a couple of months, Charley Thomas and Kalynn Park have split up as a team and failed to qualify with their new partners and Kaitlyn Lawes is unable to play due to medical reasons. If last year’s Canadian Mixed Doubles Championship is any indication, expect a mix of familiar names and of teams on the rise to battle for those coveted playoffs spots. The 2019 Canadian Mixed Doubles Championship begins March 19th at the Willie O’Ree place in Fredericton, NB. The winners will represent Canada at the world Mixed Doubles Championship in Stavanger, Norway in April.